I'm not one of those people who always has his camera at the ready. I wish I was, but I find that I'm usually carrying other things and my camera inevitably ends up in my wife's purse and, as most things do I've come to realize, finds itself buried underneath more things than the laws of physics should allow to be contained in such a small space. The odds of my getting the camera out of Lori's purse in time to capture a split-second event are almost nil. My chances of getting it out in time to photograph a slow moving turtle are only slightly better. Showing up late to Disneyland on New Years Eve is not a good idea. Actually I didn't think we were that late, but by 8pm when we arrived, Main Street had been taken over by people camping out for the fireworks and there was no possible way to travel the length of the street. This forced Disney to open a behind-the-scenes pathway between the front plaza of Main Street and Tomorrowland. I'm sure walking backstage at Disney wouldn't thrill anybody who's ever worked there, but for me it was a surreal experience. I vaguely remember cast members sitting on benches behind the Main Street stores, but I was too caught up in looking around to take any pictures. 17 years later, my memory could sure use a little photographic evidence to help me remember it clearly. We were cutting behind the buildings on the right. 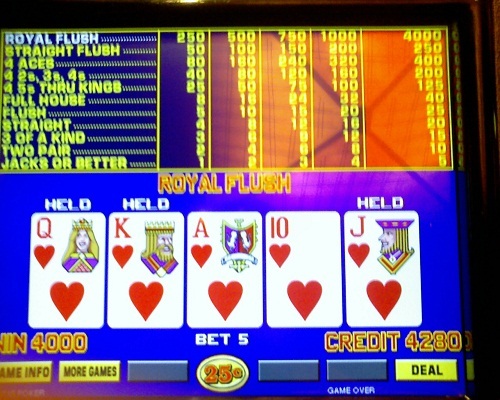 It was only our third trip to Vegas, but I'd already decided that royal flushes were mythical things that casinos fabricated to get people to keep putting money in their video poker machines. Of course, that didn't stop me from playing. I just had very lowered expectations. I became a believer early on day two of our trip though when the 10 thru Ace of hearts lined up on the machine I was playing at Treasure Island and "Call Attendant" started flashing on my screen. I sat there staring at the machine with a huge smile on my face, but it never occurred to me to take a picture of the hand. I've photographed many royal flushes since then, but I'd love to have a picture of the first one that made me a believer. Every year the Coeur d'Alene Resort sets up an amazing holiday light show, complete with a lake cruise to the North Pole. It's exactly the kind of event that's made for great family pictures...assuming of course that you remember to bring your camera. Unfortunately, this was back in the days when my flip phone wasn't capable of taking pictures, so while we had a fantastic time at Coeur d'Alene, we have no pictures to remember it by, leaving my kids free to insist that they've never been to the resort and that I should take them back immediately. A copy of one of Lori's parents pictures. At least they remembered their camera. It's not often that you get the chance to go to a league championship game. It's less often that you get to go to it in your hometown, and it's even rarer when the home team is in the final. The 2004 Memorial Cup Championships were held in Kelowna, and after an incredibly tense three periods, our Kelowna Rockets came out with a 2-1 win and the national championship (If you're not sure what the Memorial Cup is, think Final Four only for hockey). It was a fantastic experience, and I'm thrilled to say that I was there, but I can't prove it to you. Somehow, despite the final celebration taking place right in front of our seats, I never thought to take a picture. I'm pretty sure I must be in the background of some media shots from the game, but all I can really use to remember the moment by are our ticket stubs from the game. Got a picture that you wish you'd taken? Gone somewhere great and forgotten your camera? Share with us in the comment section underneath. Let me know that I'm not the only one who does things like this. This post is a part of Travel Photo Thursday over at Budget Travelers Sandbox. If you didn't get here from there, you should really head on over and check out some of the amazing travel pictures that get posted on Thursdays. Most of them probably remembered to take pictures of what they had for breakfast this morning, never mind important moments in their lives. 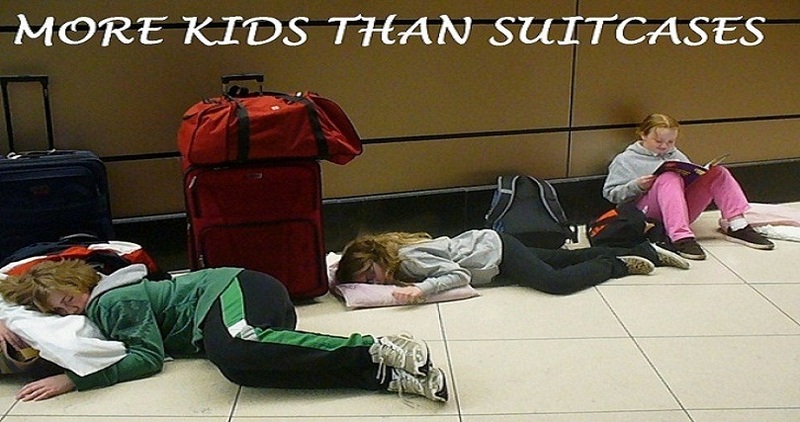 Things to Know Before Taking Your Kids to D.C.